FAQs - Saskatchewan Retirees Association Inc.
1) Why does the SRA need employment confirmation? SRA has approved organizational members from the public sector. Our mandate is to serve retired public sector employees. Organizations are approved which then provides for their retired employees to join the SRA. 2) What does SRA accept as confirmation of employment? 3) What is the registration fee used for? The SRA has a database to track all current members. The registration fee helps support the maintenance and upgrades that are made to the database periodically. 4) Where do I send my completed application and enrolment forms ? 5) How long does it take to have my membership application processed? The Membership Committee collects the mail weekly and processes it quickly. We will mail you a membership card and we drop off your GMS enrolment forms at the GMS office in Regina on a weekly basis. GMS processes your SRA Health and Dental Plan enrolment forms quickly. However, GMS starts new enrolees on the first of each month. 6) If I need more information, where can I call for assistance? You can leave a message at 306-584-5552 or can call 306-536-7869 to speak to a representative of the Membership Committee. 7) What if my membership has lapsed? If your membership has expired and you want to rejoin the SRA, you can by completing the SRA membership renewal form and paying a new $25.00 registration fee plus your annual membership fee of $20.00. If your fees are only behind by a couple of years, just provide your back payment ($20.00 X years delinquent) and we will reactivate your membership. 1) Are pre-existing conditions/prescriptions covered? As long as retirees apply for SRA membership and enrol in the SRA Health and Dental Plan within 60 calendar days of their retirement date, their pre-existing conditions are covered by the SRA Health and Dental Plan subject to the terms and conditions of the policy. Late applicants will be asked to complete a medical questionnaire by the Insurer. The travel benefit is subject to the “stability” provision as outlined in the policy. 2) May I pay quarterly or annually instead of by monthly pre-authorized debit? GMS will accept annual payments if requested by a member. Please contact GMS directly to make arrangements. 3) Do I need to remain a resident in Saskatchewan to keep my health and dental benefits? The SRA has many members who reside in other provinces and territories in Canada. You can relocate anywhere in Canada and retain your SRA membership and access to GMS benefits. 4) What happens when my spouse passes on, if they were the SRA member? A surviving spouse can continue as a SRA member and continue to be enrolled in the SRA Health and Dental Plan. The membership can be reassigned to the surviving spouse who would then need to change the GMS status for coverage from couple to single status. 5) What causes premium rates to change? The premiums for the SRA Health and Dental Plan are calculated based on: the plan claims experience, trends in the industry and the needs of the membership. 6) To whom do I make out my payments? When joining the SRA, you need to provide two cheques, one for the $25.00 registration fee, payable to the SRA Inc. and one for the first month’s premium, payable to GMS. 7) How do I reduce my prescription drug dispensing fees? Members will need to shop around as some pharmacies do allow multiple month’s prescriptions with one dispensing fee. The decision is really the pharmacy’s as they control how they choose to dispense prescriptions. 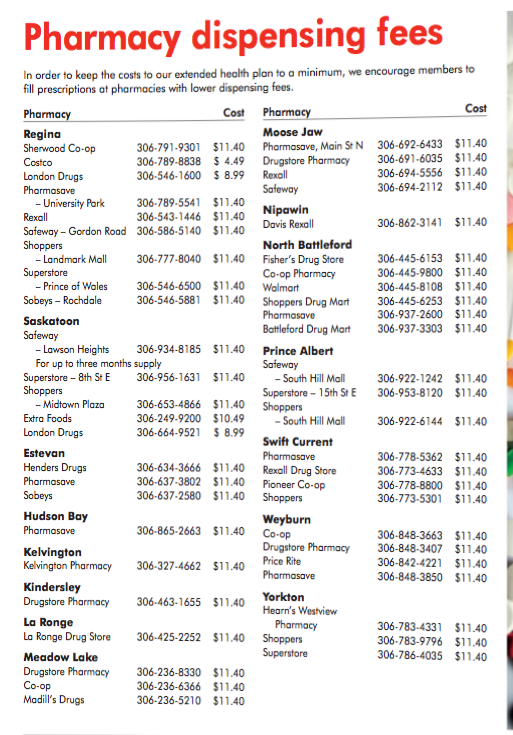 We understand that Safeway/Sobeys and some local Co-ops are allowing multiple months for a single dispensing fee. You can also consider Express Scripts Canada, an online dispensing option by contacting them at 1-855-550-6337 or at https://member.express-scripts.ca/webportal/. 8) Where can I find the current SRA Health and Dental Plan premium rates? Premium rates for the SRA Health and Dental Plan are posted under “Group Benefits”, click on “Premium Rates” for the current costs. 9) What coverage does the SRA Health Plan provide for diabetics? a) Insulin and Metformin/Glycon pills are covered, as part of the $1700 prescription drug maximum. b) Test strips, lancets, and pen needles are covered at 100% with an unlimited maximum. The pay-direct card (prescription drug card) will work for these supplies directly at a pharmacy. The blood sugar testing machine is also covered, however it would be covered up to a maximum of 1 machine per person per 5 policy years, and up to a benefit maximum of $500. This expense would have to be submitted manually to GMS. The pay-direct card will not work for a testing device. 10) How do I transfer from the PEBA Extended Health Plan to the SRA Health Plan? The SRA accepts transfers from the PEBA sponsored plan, however, retirees must fulfill obligations to the PEBA plan before making the transfer. That means you need to cancel your PEBA Extended Health and make arrangements to join the SRA Health Plan. 11) Can I enrol in the SRA Extended Health Plan and then add the Dental option at a later date? Yes, when you enrol in the SRA Extended Health Plan you can add the Dental option at the same time. You can add the Dental option later without medical evidence but only at the plan renewal date (July 1st). Members can only opt in and opt out of Dental at the renewal date. 12) Does GMS cover dental procedures that occurred outside of Canada? GMS does not cover dental procedures that occur outside Canada. The claims are not paid because it is difficult to verify whether the treatment was performed by a licensed professional as well as whether there may be fraud occurring. Also, other countries do not follow the standardized dental codes in place in Canada so its difficult to understand the treatment that occurred and may complete the claims forms in languages other than English. 13) Why am I suddenly having my prescription drug claims declined and being told I need to apply for exception drug status to the Government of Saskatchewan Prescription Drug Plan for approval? In August 2016, GMS changed their process for approvals for exception drug status (EDS) and the new automated approval system needs prior approval from the government prescription drug program before the drug claim will be processed. Pharmacies can provide a one-time exception to allow drugs to be approved for a member. However, the pharmacy, doctor or the SRA member will need to apply for EDS status approval. Once SaskHealth approves the drug, the pharmacy will get authorization and claims can again be processed electronically. Forms to apply for EDS are available from SaskHealth or your pharmacy to assist you in making application for EDS approvals. 14) How does the new Member Assistance Plan work?